So, this year, I decided to try something new for my seasonal solargraphy with pinhole cameras: Some new containers, which require extra work but will give me large-format negs. 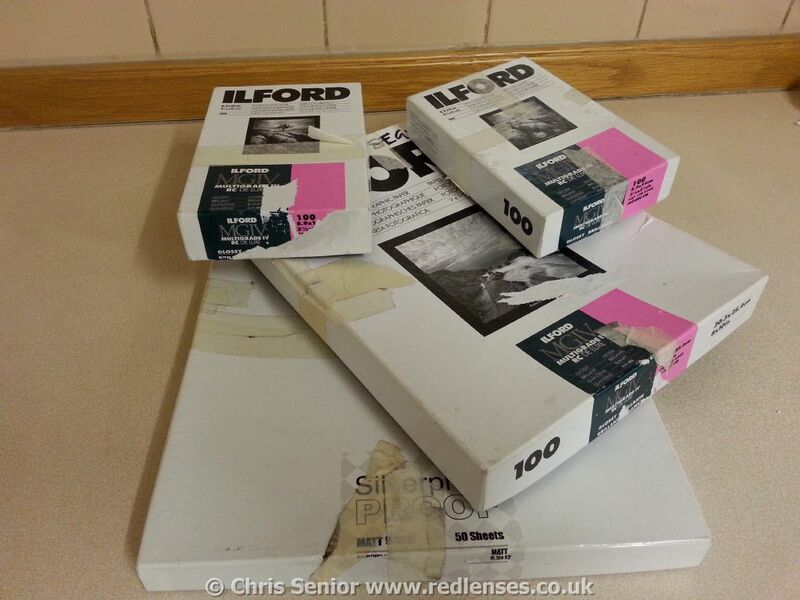 First job was to snag some bigger b&w photographic printing paper on ebay. Not an easy job these days, as it goes for a small fortune. However, I bid successfully on a mixed-lot of part-boxes which included some 8″x10″ and 9″x16″ sheets. Perfect. 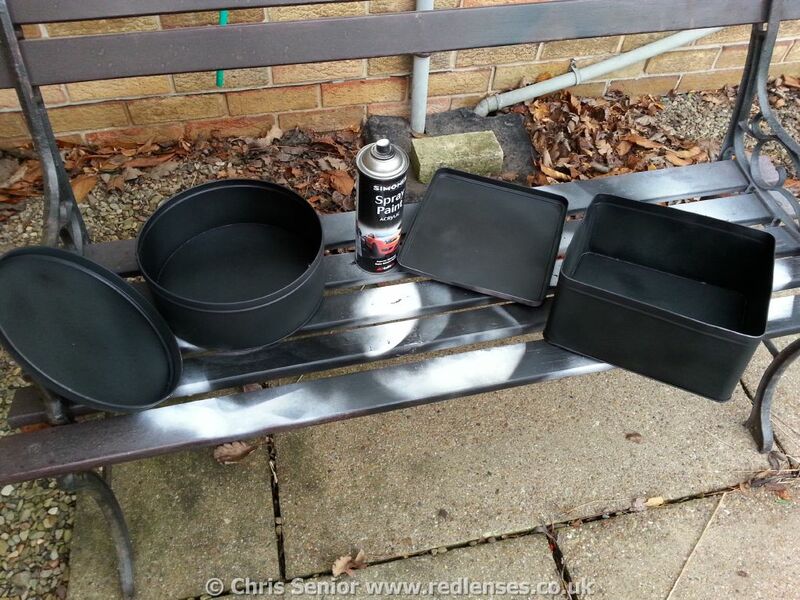 So, now I had the film, I needed to get acrylic primer and matt black spray for my chosen tins. Back to ebay once again. Having applied both coats fairly carefully, inside and out (inside to cut reflections from the metal surfaces; outside to hide fairly awful patterns and make them more ‘stealthy’! 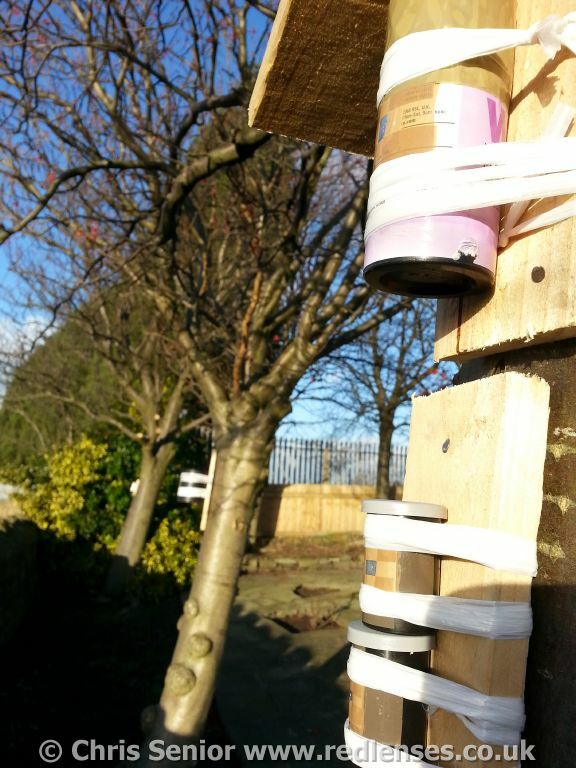 ), I then decided that I should add a lacquer coat to help them withstand the elements. A further delay, but hopefully worth it. At this point, I also found an old metal baking flour tin, perfect as it is like a scaled-up film-tub. This had all three coats applied in the space of a couple of hours. Not great but will do the job. 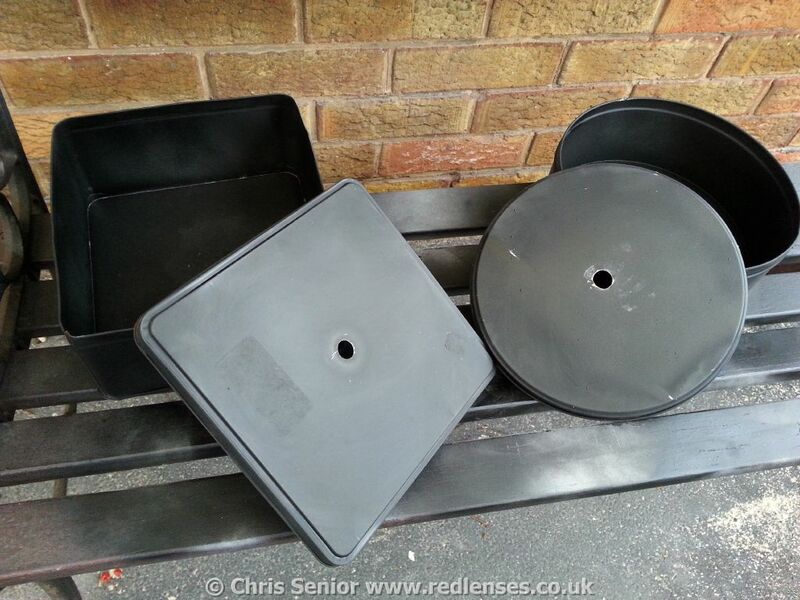 Drilling and smoothing large holes allows me to mount smaller plates, made of thick foil, into which I have carefully made and sanded a pinhole. This is stuck on with parcel-tape, which is proven to withstand six months of exposure to the elements. 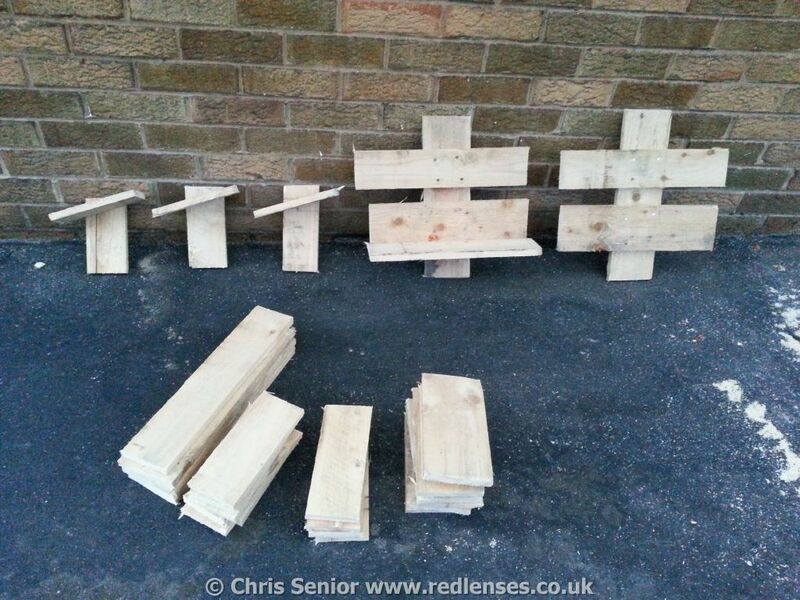 An old wooden pallet from a helpful neighbour completed the set-up, so I had some wood to make mounts from, for the varying sizes of camera I now had. In addition to my usual straight bits of wood, I added some larger ones for the tins, and also some with a sheltered top for my peppercorn tubs, which let water in. Given that I quite like the result this gives, I may not use it on them all. 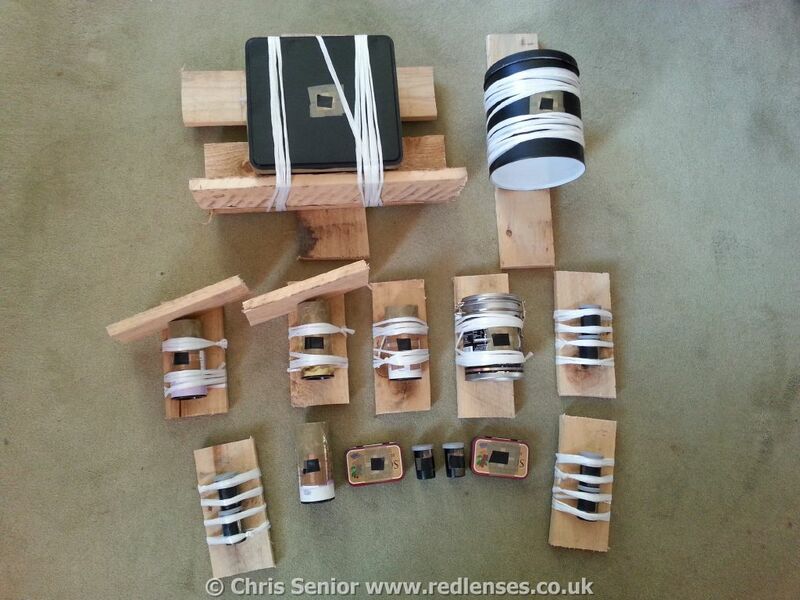 Finally, after all this work, I had a motley assembly of pinhole cameras loaded with b&w paper, secured to bits of wood using plastic twine (other string can rot after prolonged exposure to the elements). It takes rather a lot, but I already had two large reels of it, again from ebay. The small bits of black insulation tape are the lens caps / shutter, and also handily let me know if any of my tub collection actually is loaded with film, at a glance. I make sure to remove these, once secured in position. With these delays, I’ve only managed to get some of the cameras deployed today, a day after the winter solstice. Still, given the cloud here yesterday, I would not have had any sun-trails from it, so I guess one day late is forgiveable! These have been confined to the garden so far, and I may bring the large tin in after a few weeks, as I have no idea what to expect from it. This will also increase the foreground detail I get on the image. Having the handy, flat mint-tins, I’ve taped one to the inside of an upstairs window, just to see what happens. 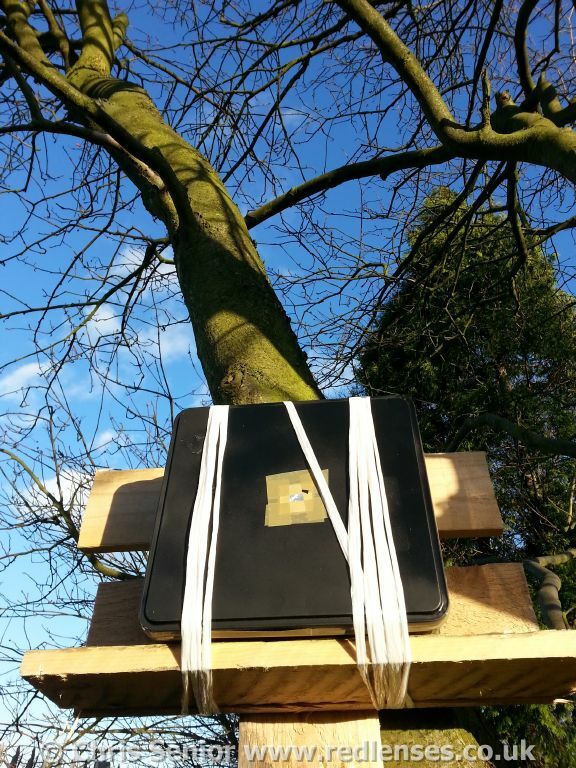 large-format cake-tin pinhole camera, looking like a home-made speed-camera! I love the fact that you never know what you will get with these devices. And that it takes weeks or months to produce a finished solargraph, depending on the result you are after. A pleasant antidote to the instant phone-to-Facebook/Instagram in seconds process. Check back with me in future posts (you may want to follow my blog!) and I’ll keep you up to date with any developments (ouch!). This entry was posted in equipment, techniques. Bookmark the permalink.